A star athlete, valedictorian and the most popular guy in school, Jason is the envy of every boy in school and the target of school girls’ affection. However, despite all the girls thrusting themselves at him, every time Jason walks down the hallway, he only has eyes for one -- Peter. 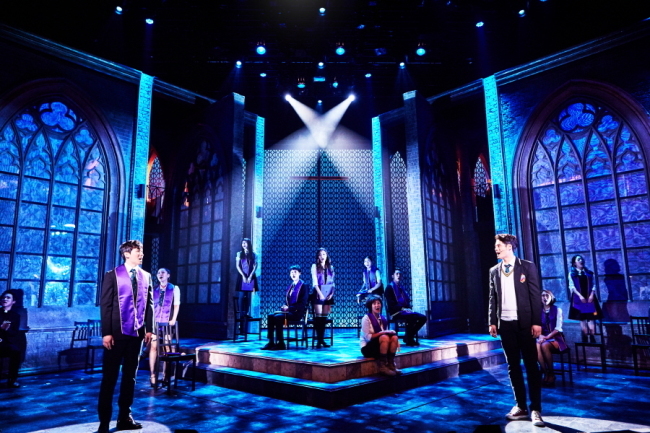 The critically acclaimed Off Broadway production “Bare the Musical” has once again returned to the Seoul stage to tell the tale of two Catholic boarding school students Jason (played by Seong Du-seop) and Peter (played by Jung Won-young). Originally titled “Bare: A Pop Opera,” the production delves into the lives of two homosexual teens and the social labyrinth they face as they try to navigate and survive the heavily judgmental tribulations of high school life. While Peter wants to make their relationship public, Jason is reluctant for fear of being ostracized. The relationship hits choppy waters as Peter struggles to remain silent about their love. In a country that is still widely conservative and hush-hush about homosexuality, it is not unreasonable to wonder if the original Off Broadway script may have been watered down, de-emphasizing or toning down the passion between the two high school boys. However, it was a pleasant surprise to find that there was nothing of the sort: No blacked-out spotlight prior to a kiss, no fake kissing-on-the-cheek make-out session. There appeared to be no “shielding” of the audience, which gave the production an authentic feel. Although the vocal chops were a bit lacking for the most part, the biggest draw of this musical are the characters. Seong and Jung’s portrayal of two struggling lovers left many questions about society today. Not merely the condemnation of homosexuality in most religions, but the inner struggles of the young characters questioning their own morality. Those in the audience won’t be able to help but ponder their own prejudices and biases, and question whether or not a different ending would have occurred if the two had come out or remained in the closet. A production that offers humor, drama and tragedy, “Bare” is a refreshing tale that should not be confused with or be referred to as a “gay musical.” It is a production about the love between two people desperate to live a life of truth and freedom. This year’s rendition of “Bare the Musical” also stars Kim Seung-dae, Suh Kyung-soo, Park Kang-hyun, Choi Suh-yeon and Min Kyeong-ah. 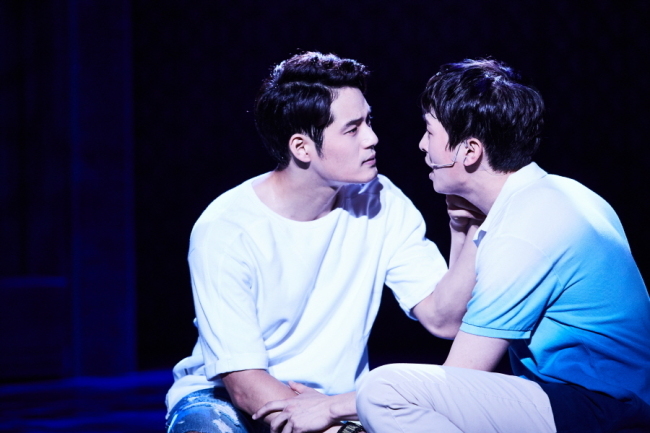 “Bare the Musical” will be staged daily (except on Mondays) at the Doosan Art Center’s Yongkang Hall in Seoul until Sept. 4. Ticket prices are 66,000 won ($58) and 88,000 won. For more information, call 1588-5212.